If the population of village R in 1997 is 32000, then what will be the population of village Y below poverty line in that year? Population of village R = 32000 (given). Let the population of village Y be y. Then, 16 : 15 = 32000 : y => y = (15x32000)/16= 30000. Therefore Population of village Y below poverty line = 52% of 30000 = 15600. 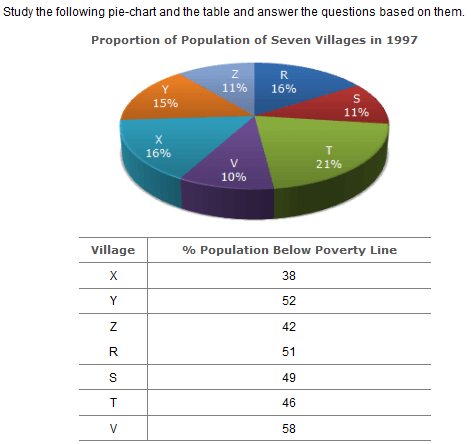 Find the population of village S if the population of village X below poverty line in 1997 is 12160. Let the population of village X be x. Then, 38% of x = 12160 => x = (12160x100)/38 = 32000. 16 : 11 = 32000 : s => s =(11x3200)/16= 22000. If in 1998, the population of villages Y and V increase by 10% each and the percentage of population below poverty line remains unchanged for all the villages, then find the population of village V below poverty line in 1998, given that the population of village in 1997 was 30000. Population of village Y in 1997 = 30000 (given). Let the population of village V in 1997 be v.
Then, 15 : 10 = 30000 : v => v = (30000x10)/15= 20000. Now, population of village V in 1998 = 20000 + (10% of 20000) = 22000.